Shingle roofing is the most popular roofing option for a variety of reasons: longevity, low cost, and versatility in style, color, and design. Shingle roofing can be installed in nearly any home in a short time-span, with positive results. 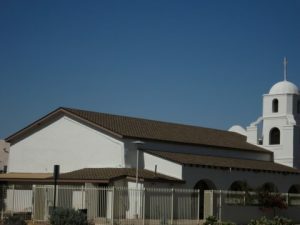 If you live in Mesa Arizona and nearby areas, contact Express Roofing to schedule your free estimate. We’re here to help with shingle roof installation and replacement. Shingle roofing can vary in size and scope, but we always apply our same focus to every project. We sleep well at night knowing we do not cut any corners and only use the best materials available. Take a look at our photo gallery for examples of recent shingle roofing projects. Is Shingle Roofing Ideal For Your Home? According to the Asphalt Roofing Manufacturers Association (ARMA), 80 percent of all houses in the United States have shingle roofing. Why is it so popular? There are a variety of different benefits that come from installing shingle roofing as opposed to other forms of roofing. First of all is the lifespan. Shingle roofs last longer than other kinds of roofing. Additionally, the cost of shingle roofing is well below most other alternatives, making it an attractive choice for those who want a sound roof at a fair price. The style of shingle roofing is another pronounced benefit, as they can fit the style of nearly any house with ease; in addition, thanks to recent technology, they are customizable in style without losing any effectiveness. 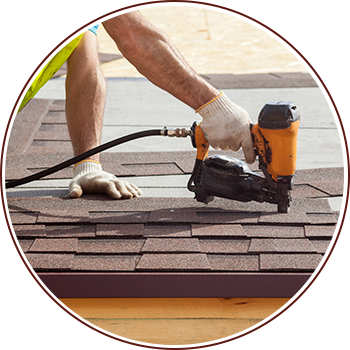 Another benefit is that because of their popularity, experienced roofers have installed, repaired and replaced a lot of shingle roofs. Express Roofing has successfully replaced hundreds of shingle roofs. When Should You Replace a Shingle Roof? Even though shingle roofs last quite long, you should also be aware of trouble signs that let you know it’s time for a replacement. The first sign that you need to install new roofing is if you have missing or bent shingles; this can dramatically decrease the effectiveness of the roofing. Additionally, if shingles are missing or broken, it is necessary to have them replaced as soon as possible in order to avoid costly water damage. If there are any signs of water damage on the exterior or interior, such as mold, wet wood, or visible leaking, the roof should be replaced immediately. Like many other roofing options, damaged flashing is one of the most severe problems that can occur. The flashing is the layer of waterproof material that is placed underneath the shingles in order to prevent any water from leaking into the house. If the flashing is damaged, it can cause leaking and some very costly damage to the home. You can depend on us to install your new shingle roof properly, from the ground up to ensure your roof has the longest life possible. We can also advise you with regard to whether your roof needs replacement or if repairs will safely hold you over for a few years. Buckling shingles is a common problem. This typically occurs when shingles have been installed improperly, allowing moisture to build up underneath; this often happens if you have placed new roofing directly over an older roof. Curling is another problem and is indicative of poor ventilation and poor fastening. Another common issue involves finding granules from your roof on the ground. This could mean your roof is aging and may need replacement. If you are looking to install a new roof, or if you’re having problems with current roofing and need it replaced, we offer a variety of options to restore your roof back to great condition. To learn more about your current roofing project, call 480-226-4245 and we will provide you with a free, detailed estimate.